Tax Sovereignty in the BEPS Era focuses on how national tax sovereignty has been impacted by recent developments in international taxation, notably following the OECD/G-20 Base Erosion and Profit Shifting (BEPS) Project. The power of a country to freely design its tax system is generally understood to be an integral feature of sovereignty. However, as an inevitable result of globalization and income mobility, one country’s exercise of tax sovereignty often overlaps, interferes with or even impedes that of another. 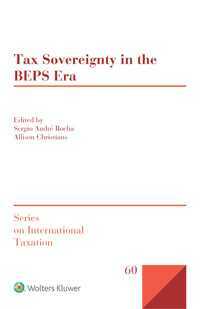 In this collection of chapters, internationally respected practitioners and academics reveal how the OECD’s BEPS initiative, although a major step in the right direction, is insufficient in resolving the tax sovereignty paradox. Each contribution deals with different facets of a single topic: How tax sovereignty is shaped in a post-BEPS world. This book helps readers navigate in these uncertain BEPS times, as well as provides insightful assessments on how countries’ tax policies might change in the near future. Through these chapters the authors provide authoritative commentaries on the necessary preconditions for exercising the power to tax in today’s world and the impacts of the emergence of the digital economy. Their perspectives and recommendations prove to be highly essential to all policymakers, legislators, practitioners, and academics in the international taxation arena regarding information that is essential for interpretation and decision-making in the current international tax environment. CHAPTER 3 Justification and Implementation of the International Allocation of Taxing Rights: Can We Take One Thing at a Time? Chapter 11 How Are We Doing with BEPS Recommendations in the EU?